There is quite a bit of information flying around the blogosphere regarding Community / Tribe / Platform building. 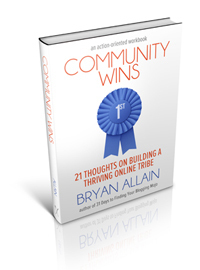 So I have to admit I was a bit skeptical when I received my copy of, Community Wins: 21 Thoughts on Building a Thriving Online Tribe. However, I have been regular reader of Bryan Allain’s blog for several months now, and I read his previous book 31 Days to Finding your Blogging Mojo, so I did not need a lot of convincing to pick up his newest book. I soon discovered the book to be well worth the investment of my time. It is well organized as each thought builds on the previous one. Bryan also goes far beyond just theory. Each chapter is concluded with action steps to put each thought into practice. Bryan also has an enjoyable writing style. I could easily see Bryan sitting in my living room coaching me through the community building process. His strange sense of humor (strange but somewhat like my own) adds just enough of a break to keep the book from coming across as a technical how to. He covers a great balance of motivation and how to handle the ups and downs when you share your passions with the online world. Just a few of the thoughts include, “Acceptance and Rejection,” “Expectations and Dreams,” “Networking Online,” and my favorite, ‘Make Deadlines Matter.” Bryan even reminds the reader not to forget the lurkers, those people who are just hanging out on the edges of our community. With a little bit of time and effort lurkers have the potential to move into the life of the community. Bryan has written a great book based on his own experience of building a successful community. His thoughts are not an easy magic bullet, but if the reader takes the time to implement the actions steps for each of the 21 thoughts, they will progress far along their own community building journey. Because Bryan has done a great job combining style with plenty of practical information I would highly recommend Community Wins to anyone desiring to build an online community.